Honda Struts Leaking Problem - What To Do Next? A common problem noted among some types of Civic is a leakage from the Honda Struts, particularly those at the front of the vehicle. This often means that they need to be checked by a garage, and also handled by the Honda Complaints department. This is a relatively minor problem, but it can cause annoyance, and some are only too eager to try and find a way to solve this difficulty. The Honda Civic suspension is not the only part of the vehicle where joins have caused leaks, but it is perhaps more obvious in the struts. The issue often appears when the car is being driven. While moving, the driver will hear a curious knocking problem, as though there was someone trapped under the axle, and is tapping to get out. This problem is particularly obvious when the driver is moving over lumps and bumps in the road, and also when the car is being driven along a gravel pathway. Anything where the suspension needs to be active will trigger this curious knocking sound. Only when the driver takes it to a garage does it become clear that the problem is the Honda suspension parts, and most specifically the Honda struts. This is an acknowledged problem, which the company recognized and promised to fix under warranty. The main solution to the difficulty is by replacing struts. As noted, the front two are the most commonly affected, and the company recommended replacing these as a pair. Although this is the solution to the problem, as advised by the company themselves, some drivers have noted a further problem occurring even after the initial replacement. This can occur after 30,000 miles, and again at around 60,000. Each time, they will have to be replaced completely, usually with the pair being done at once. The leaking of the strut fluid can cause problems with the stability of the vehicle, and so while it is not a really significant fault, more like an inconvenience, in fact it could affect handling in poor conditions. Drivers should bear in mind that they should try and avoid badly pot-holed roads while they are waiting for the warranty claim to be agreed. As an alternative, they might decide to go ahead and change the car struts without waiting. These problems with the front Honda struts are under full warranty, which means that drivers should not have to pay in order to have them replaced. 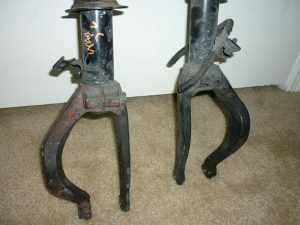 The only debate might occur if the struts regularly leak, in which case a dealer might not be keen to replace them regularly. In this case, and if the parts do need fixing quickly, then car owners can expect to pay upwards of $700 for the work being done. Although the front struts have been acknowledged as faulty, drivers should be aware that there is no recognition of a similar problem with the rear parts, and this might cause problems if leaks start to occur there, too.